In his highly anticipated sequel to The Elements, Theodore Gray demonstrates how the elements of the periodic table combine to form the molecules that make up our world. Everything physical is made up of the elements and the infinite variety of molecules they form when they combine with each other. In Molecules, Theodore Gray takes the next step in the grand story that began with the periodic table in his best-selling book, The Elements: A Visual Exploration of Every Known Atom in the Universe. Here, he explores through fascinating stories and trademark stunning photography the most interesting, essential, useful, and beautiful of the millions of chemical structures that make up every material in the world. Gray begins with an explanation of how atoms bond to form molecules and compounds, as well as the difference between organic and inorganic chemistry. He then goes on to explore the vast array of materials molecules can create, including: soaps and solvents; goops and oils; rocks and ores; ropes and fibers; painkillers and dangerous drugs; sweeteners; perfumes and stink bombs; colors and pigments; and controversial compounds including asbestos, CFCs, and thimerosal. Big, gorgeous photographs, as well as diagrams of the compounds and their chemical bonds, rendered with never before seen beauty, fill the pages and capture molecules in their various states. As he did in The Elements, Gray shows us molecules as we've never seen them before. It's the perfect book for his loyal fans who've been eager for more and for anyone fascinated with the mysteries of the material world. Nick Mann is the photographer of The Elements: A Visual Exploration of Every Known Atom in the Universe. Aside from having photographed more elements and compounds than probably anyone in the world, he is an accomplished landscape, sports, and event photographer. He lives in Urbana, Illinois. Theodore Gray is the author of The Elements: A Visual Exploration of Every Known Atom in the Universe; Theo Gray's Mad Science: Experiments You Can Do At Home, But Probably Shouldn't; Mad Science 2: Experiments You Can Do At Home, But Still Probably Shouldn't; and Popular Science magazine's 'Gray Matter' column. With his company Touch Press, Gray is the developer of best-selling iPad and iPhone apps, including The Elements, Solar System, Disney Animated, The Orchestra, The Waste Land, and Skulls by Simon Winchester. 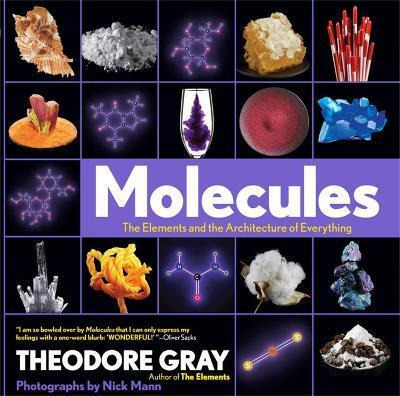 He lives in Urbana, Illinois.Theodore Gray is the author of the bestselling book The Elements: A Visual Exploration of Every Known Atom in the Universe and Theo Gray's Mad Science: Experiments You Can Do At Home, But Probably Shouldn't. He is the author of Popular Science magazine's monthly column, 'Gray Matter' and the proprietor of periodictable.com. He is also cofounder of Touch Press, an ebook company that is defining the future of publishing, and the cofounder of Wolfram Research, creators of the world's leading technical software system, Mathematica (c) and Wolfram ? Alpha (TM). He lives in Champaign-Urbana, Illinois.